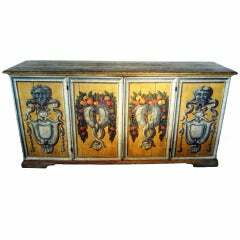 Venetian sideboard from 20th century. Nicely carved, gilded and painted wooden furniture in neoclassical style. 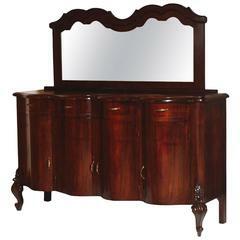 Sideboard of nice line and excellent proportion, it can be easily placed in different parts of the house. Furniture equipped with two drawers and two front doors of good capacity and service. Interior of the sideboard complete with fixed shelf. Top in painted wood. Furniture complete with a working key that has several signs of wear, a lack of wooden decoration on the left side and small drops of color. Overall in fair condition. Furniture complete with a working key that has several signs of wear, a lack of wooden decoration on the left side and small drops of color. Overall in fair condition. Code: FN37 Early 20th century. Baroque venetian credenza mirrored sideboard walnut and burl walnut Measure cm: H 107+74 x W 186 x D 64.